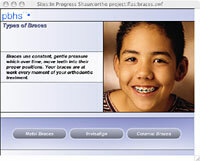 Braces use controlled, gentle energy over time to enhance your smile. Your braces are hard at work throughout your orthodontic treatment. While braces are available in a variety of styles, including hi-tech ceramic and metal, they all have the same goal: To correctly align your teeth and jaws for a beautiful and healthy smile, and optimal oral health. Clear braces are a popular choice for patients desiring a discreet alternative to traditional metal braces. In addition, clear aligners such as Invisalign® work well and you can avoid the braces and wires completely. Metal braces are an excellent traditional choice, and are smaller and more comfortable than ever before. Naturally, these are more noticeable than tooth colored braces and clear aligners. To avoid metal braces all together, click here to learn about Invisalign treatment.